Happy belated Halloween! ðŸŽƒðŸ‘» Iâ€™ve been working on a post about our road trip to California, but itâ€™s gotten so long that I think Iâ€™m going to have to split it into a few parts - not a bad thing, since we took a TON of pictures! Since thatâ€™s not finished yet, I thought Iâ€™d share some highlights from last weekend - including my 31st birthday! 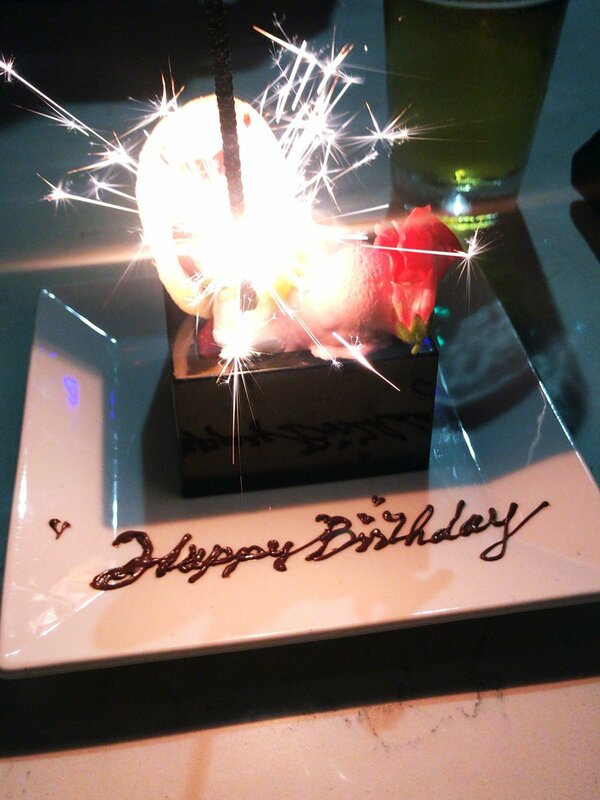 My birthday was on Sunday this year (gross) so we decided to go out to dinner on Friday. 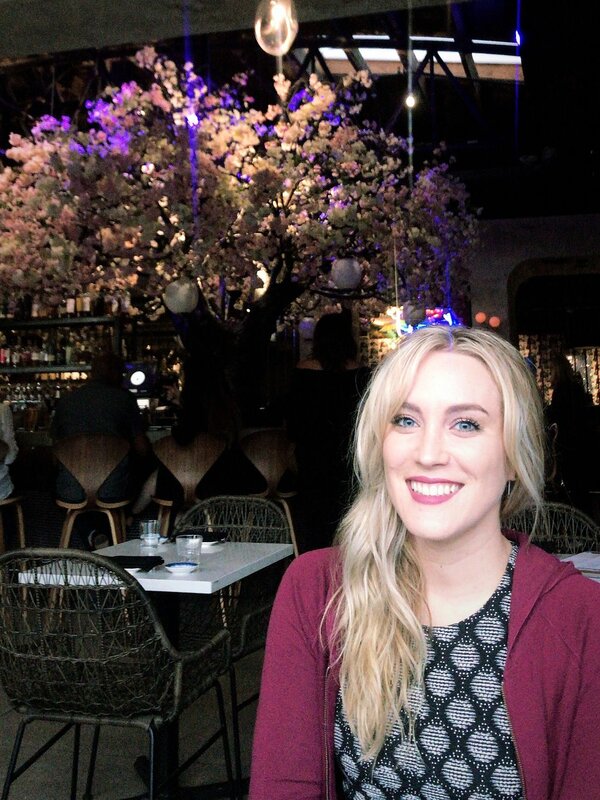 We tried a spot in Little Italy called Cloak & Petal. 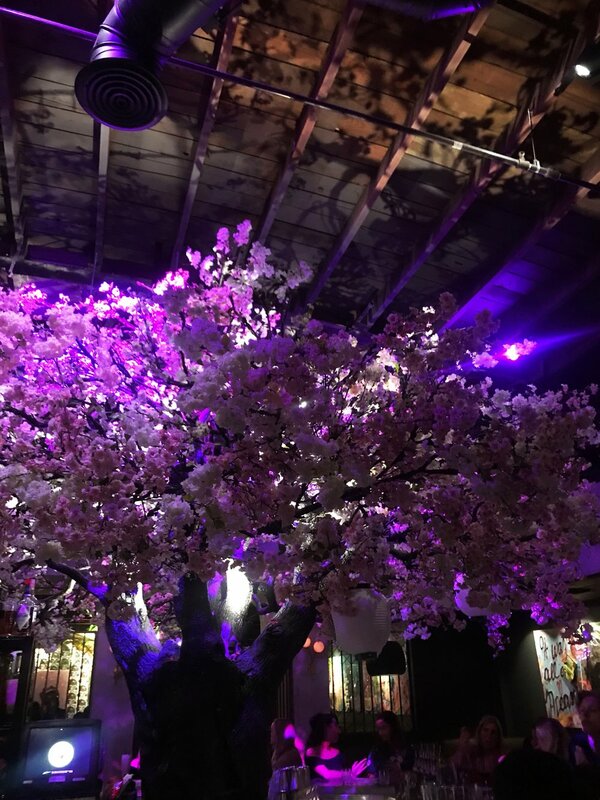 This was a great date spot - there are huge (obviously fake) cherry blossom trees in the middle of the dining room, and they have large windows that open onto the street. Itâ€™s still a novelty to be able to enjoy nice weather in October, and since we were seated by the front windows we could watch kids walking by in their Halloween costumes! The food was very good - my favorite thing we ordered was the Cesar Chavez & Main St roll, full of spicy tuna, jalapeÃ±o & habaÃ±ero. I love spicy sushi rolls and this didnâ€™t disappoint! I ate it too fast for a photo but I have one of our oysters (also delicious) and my cocktail, the Absin-tea-ism. We were able to try out a few other spots Friday night as well - pre-dinner beers at Bolt Brewery and a nightcap at El Camino afterwards, both just a short walk from the restaurant. I enjoyed both spots (love Bolt Breweryâ€™s lightning logo, obviously) but especially liked the kitschy dive bar feel of El Camino. On Saturday we got up early to check a San Diego bucket list hike off our list. We drove out to Ramona to hike up to this classic photo spot. We took a shorter back route up to the top, which was only about 4 miles round trip but was pretty steep. Next time Iâ€™d take the longer route from Lake Poway, which apparently has better scenery - but we still got some great views! October 27th, 2018 - You can see all the way to downtown San Diego from up here (canâ€™t tell from the picture, though). I was also extremely proud of myself for getting up onto Potato Chip Rock considering my fear of heights. The only way you can tell Iâ€™m super nervous is because Iâ€™m standing really far from the edge! Afterwards we grabbed brunch in Ramona at Marinade on Main. Everyone keeps telling me that California is full of tiny, healthy portionsâ€¦ but the â€œsaladâ€� I ordered was more fried chicken & goat cheese than anything else! The portions were huge but delicious, and luckily we were super hungry after our hike! I thought I had some pictures but they seem to have disappeared, unfortunately. On our drive back, we randomly stopped off at the Rashelica Winery & Art Garden because we were distracted by giant letters on the side of the road proclaiming ART. This place was pretty bonkers - we couldnâ€™t even tell at first what exactly it was! A nursery? An eclectic personâ€™s backyard? An outdoor museum? They appear to have a restaurant on site but the real highlight is definitely the enormous art garden with some truly strange sculptures, big chess set, and pretty plants. Worth a stop if youâ€™re in the area for sure - it was free and thereâ€™s a parking lot as well. Sunday was a pretty easygoing day because we had been out at a Halloween party the night before, but we made up for it on Monday night. We headed to the Casbah, an old-school rock/indie/punk venue in Little Italy. I liked it right off the bat - very divey and very small. Great place to see a show! First up was Franks & Deans, who cover Dean Martin & Frank Sinatra songs complete with a burlesque dancer (they are from Vegas, you can tell). We hadnâ€™t really been expecting much but they were actually pretty fun to watch since I grew up listening to those songs. This was so weird and awesome and I loved it. In case you canâ€™t tell, theyâ€™re a McDonaldâ€™s-themed Black Sabbath cover band and they are bonkers - even their Wikipedia article is a real delight. The highlight is definitely the costumes and the stage spectacle (I wouldnâ€™t say theyâ€™re really very good), but if you like Black Sabbath and youâ€™re into weird stuff/Halloween/junk food, this is a blast. Definitely the most fun Iâ€™ve had on a Monday night in a while, and it was fun to check out a music venue in my new city. I did dress up for Halloween last Saturday, but because we moved recently and Iâ€™ve been a bit distracted, I wasnâ€™t really super happy with my costume. I needed something low-cost and easy, so I ended up dressing as Mugatu. It turned out alright for a last minute job! Iâ€™m glad I got to celebrate my favorite holiday still, even though weâ€™re not totally settled in yet! Weâ€™ve also been spending most nights the last week or two watching the Haunting of Hill House on Netflix. I loved it! Itâ€™s creepy-scary (not gory at all) and I regularly ended up with goosebumps, and itâ€™s a one-season show so itâ€™s not a huge time commitment. Itâ€™s worth a watch even though Halloween is sadly over. Iâ€™m planning on checking out the traditional Dia de los Muertos celebrations later today - being so close to Mexico itâ€™s no surprise that San Diego is home to some pretty spectacular-looking parades & festivals. Iâ€™m hoping to bring my camera along - if I end up with some good photos, maybe Iâ€™ll write a separate post about that! Thatâ€™s pretty much what Iâ€™ve been up to lately! Iâ€™ve been feeling inspired by some "daily lifeâ€� blogs Iâ€™ve discovered lately (my favorite is Sleepy Waldo) and since Iâ€™m mostly sharing this with family & friends far away/back in Chicago, I hope to do more of these kind of posts. Iâ€™ve been trying to remember to get better about taking photos, even when they arenâ€™t Instagram-worthy or perfect. Iâ€™m also trying out a new meal-planning service that I have loved so Iâ€™m planning on sharing a bit about that as well. Definitely have more posts coming soon - maybe Iâ€™m finally getting into the blogging groove a little bit! TORNADO ALLY Â© 2018. ALL RIGHTS RESERVED.